List Rules Vote up the most plausible fan theories about Kingdom Hearts. The lore of Kingdom Hearts has grown into an ever-expanding universe thanks to this all-time great RPG's basis in an already massive Disney universe. So Kingdom Hearts fan theories are a given, as is the case with every expansive universe, but this one offers a particularly broad canvas. What's more, Sora, the Darkness, and the growing list of Keyblades are set to return, sparking a whole new wave of fan theories about Kingdom Hearts 3. In the third installment we're likely to learn how the Disney worlds fit together in this universe, who the mysterious King is, and what exactly is in the Master of Masters's box. There are so many unanswered questions left from a series that has more entries than Guardians of Light, there's only one thing to do: speculate. There is a "Disney Theory" beyond the universe of Kingdom Hearts that seeks to prove all the Disney movies exist in the same universe. Well, one observant gamer points to a line from the Kingdom Hearts universe that essentially claims the Disney Theory is true, which extends to the universe of the game. "In Kingdom Hearts: Birth By Sleep, Kairi’s grandmother tells her a story of a time where all the worlds were connected in light. Darkness crept in when people began to fight over the light, and that is how the worlds became separated." Pretty simple. Whether it's true or not, one can't argue the existence of said claim within Kingdom Hearts itself. The theory is pretty elaborate (if you care to read it), discussing light and dark balancing each other in the universe, but it all comes down to grandma's claim. Redditor /u/PresWelke's theory that Sora is the one King in the world of Kingdom Hearts is based on some pretty sound, if not straightforward, reasoning. "The symbol representing Kingdom Hearts itself is the crown on the Kingdom Key and Sora's necklace. Thus leading to the belief that Sora is the rightful king (hence why the symbol is in the shape of a crown)." That alone may not be convincing, but this Redditor goes on to point out a couple more design elements in the series that give further proof. 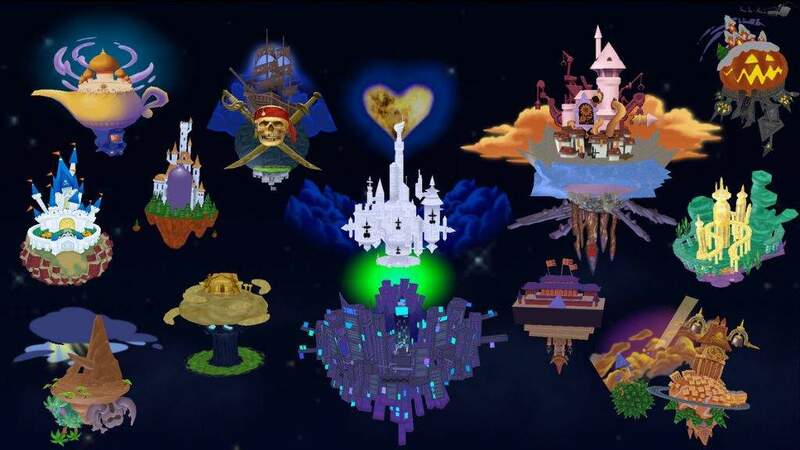 One is "the [Kingdom Hearts I.5] cover art" which "not only features Sora sitting on a throne of Keyblades, but he is wearing the very same crown that represents Kingdom Hearts." Then there's the χ-Blade, which is known to be comprised of two Kingdom Keys, one of which is indeed Sora's Keyblade. Towards the end of BBS, Terra-Xehanort gets a bit of a jumpscare when the Lingering Will emerges and proceeds to engage him one-on-one. He exclaims: "Your body succumbs, your heart submits, so why does your mind resist?" This got me thinking. Could Xehanort's time-travel foolery in KHDDD have given Terra a chance at reviving himself? We have his heart and his body, AnsemSoD and Xemnas respectively. Maybe now we'll just need his will to round them all together? This could also be a great excuse for a normal Terra and a normal Xehanort to meet face-to-face once more in KH3. What if the Master is keeping his heartless in the box and he's a nobody! The reason he acts so strange/silly could be because he's faking having a heart. It could be why he has a special power to see the future, and definitely why Luxu would be so surprised to hear what's in the box. And after the Master fades, if his heartless were to be destroyed, he would be reborn.